Before writing for this website, I’ll sometimes race off to a remote location in an effort to become more inspired. Ten miles of twisties might become twenty, then forty, eighty, maybe a full ton of warm-up curve carving to get my head goin’. The result is always the same: fatigued in some indie cafe, an espresso drink in my hand, surfing social media while paying bills. Why did I come here again? Eh, whatever. 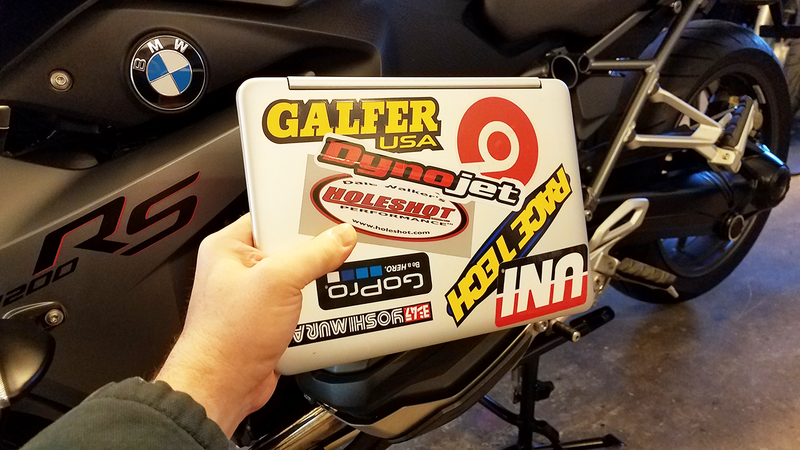 A laptop can prove pretty handy while on any motorcycle trip but good tech doesn’t come cheap … or does it? There are various deal promotions on the web listing the “best laptops under 500” among others. I say that’s still too much money for something I’ll regularly overhand into my hard luggage before shaking it rigorously for as many as three hundred miles per day, occasionally punctuated with an assault on Deals Gap. Now, this isn’t to say that I’ve never multi-wrapped my (not so cheap) Mac in a towel before packing it pillion and raising my side stand. Yes, if you own an HP, Dell, Apple … whatever, you can always baby it to that motel-anchored rally. My own concerns are outside of this scenario where multiple destinations are booked and everything in between calls for what we as sport touring enthusiasts look forward to most. No, if we’re going to bring a laptop with us on a true-to-form motorcycle tour, we need something smaller, lighter and cheaper than the norm. Our best option is likely a cloud-based platform. While this opens the door to many prospects, I myself always like to narrow things down, buying whichever box performs better and more reliably than the competition. 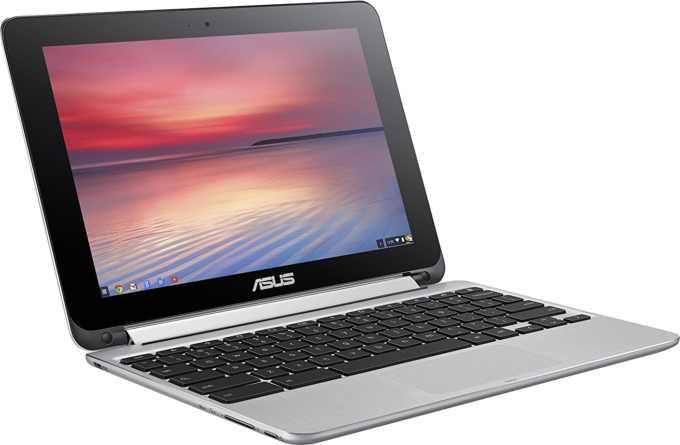 The ASUS C100P, which is still for sale online through various outlets, now has it’s fair share of next-gen cousins. Each operates at an equal or greater level but even the original is more than enough for our travel needs. In fact, it has features I didn’t know about until I outlined this article. For example, I never knew this mini laptop was a 2-in-1 system. As I went to find relevant stock photos for your viewing pleasure, I noticed … “Wait. Did they break it? Why is that one bent backwards?” before staring at mine next to me. Yes, it can in fact be folded completely backwards, disengaging the keyboard/trackpad and shifting gears into tablet overdrive (see video above). A mini laptop can prove pretty handy while on any motorcycle trip but good tech doesn't come cheap ... or does it? Not that the above is anything new, but at just over $250 and boasting a minimalistic 10.1″ screen, I simply never would’ve “thunk” it. Maybe it’s because my previous junkbook, which I’ve since relinquished to one Mr. Travis Burleson in hopes that he might suffer to my amusement, would often times become unresponsive if not prone to crashing. Let it be known that this electronics arena, one of iPads and dual-use miniature laptops, is no place for anything Windows. Remember, we’re not trying to launch anything Elon Musk is building over at Space X. We’re simply looking for a way to check email, write an article or ten, chat with friends, maybe pay a bill and even Skype upon occasion. For these tasks and more, the ASUS has you covered. All of the above comes standard for the price of tires aaannnd it’s self updating. Users are never informed about the latest Windows software being “ready” to explode all over their insufficient storage and soon to be lost data, which will commence in roughly … ZOT! No, Chromebooks perform in a less typical venue and tickets at the door are far more reasonably priced. The extra $70 spent above my initial $200 threshold makes this compact, wallet-friendly machine feel as good as a MacBook Airand it weighs less. 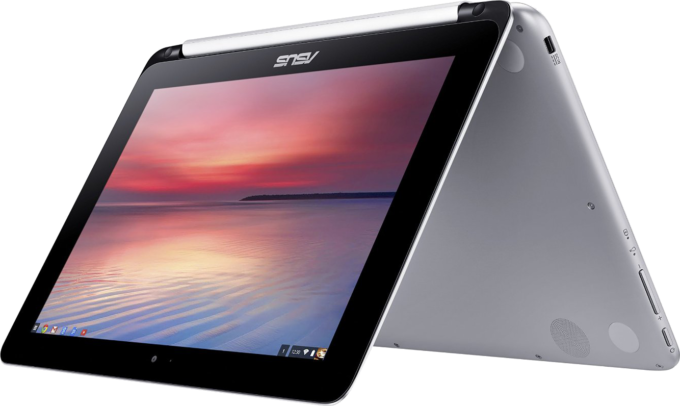 It’s aluminum chassis speaks to it’s durability but the 2-in-1 touch screen tablet mode is what hits a home run. My ASUS never lags, gets hot or shows any need for restarting. It just works … but no tech is perfect. Of course the C100P has it’s “character”. Out of the box, all optional trackpad settings are active. The touch-sensitivity is so high, it’ll send an accidental email to your arch nemesis before it’s even arrived at your doorstep. When two-finger scrolling, the Y-axis is reversed, so dragging downward scrolls downward and vice-versa (awkward). Also, ASUS, a word … Touch-click isn’t a click. Click is a click. Touch-click is psychic warfare. These “issues” are mentioned for humor’s sake, though. 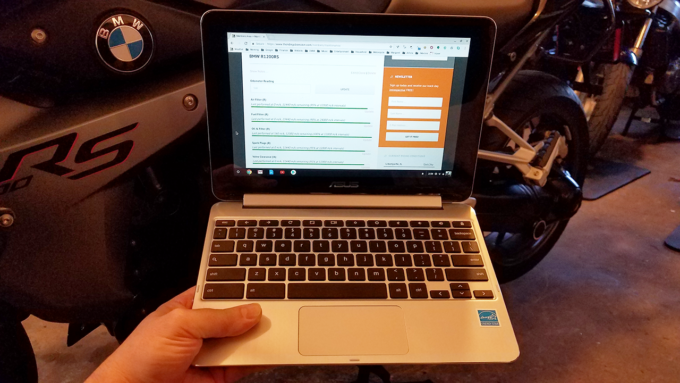 With a bit of tuning circa preferences, this little laptop performs better than one might expect. It’s integrated webcam, HDMI out, two usb ports, SD card slot and 3.5mm microphone jack (just discovered that myself) each make this tiny tin calculator a Swiss Army Knife among Chromebooks. When it comes to laptops and motorcycle touring, the grey area for what’s compatible is surprisingly narrow. It needs to be small but feature rich. It must be light weight and yet impressively durable. Then there’s the matter of keeping the total cost under $500. For post ride networking, this might seem like a rather tall order. In the case of the ASUS C100P Chromebook, all boxes are checked two-fold. It’s cheap enough for worry-free rough housing, powerful enough to get the job done and riddled with peripheral access for multi-purpose use. 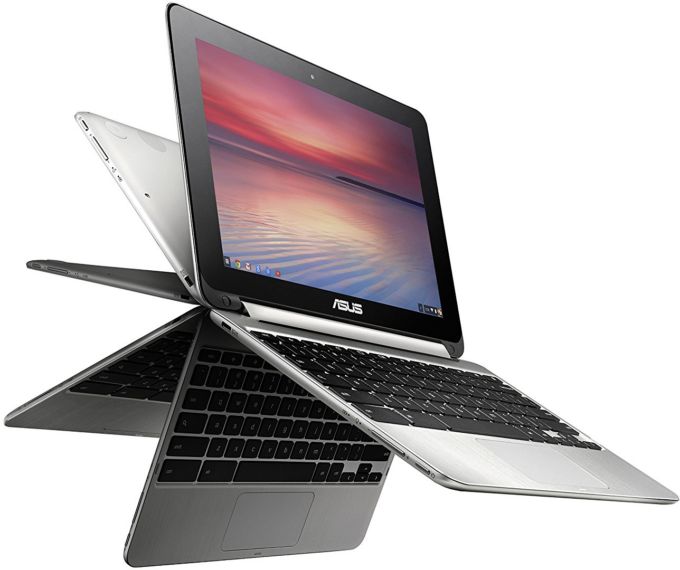 Of all the Chromebooks currently on the market, this one takes the prize. 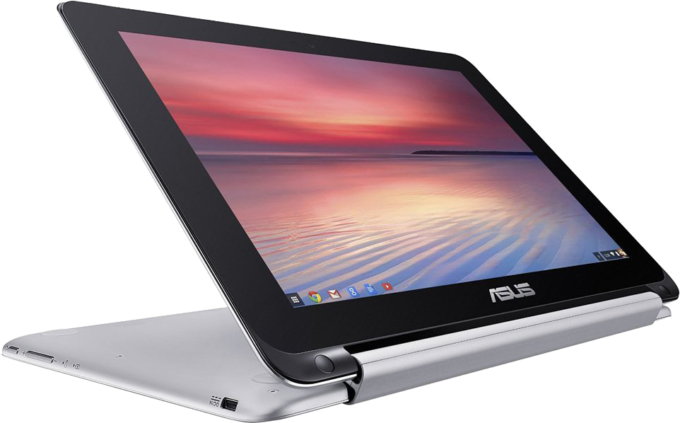 There are other Chromebooks worthy of mention even if only for their use of the more efficient operating system. When all that’s necessary is bang-for-the-buck cloud access, Google innovation does the trick. Well, that is unless you opt to install Neverware on an old windows junkbook. 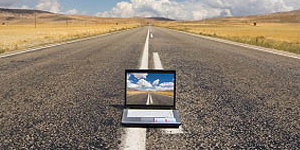 What Technology Do You Bring With You On A Motorcycle Tour? There are alternatives to stowing a laptop when you travel. What technology (or lack thereof) do you prefer? What do you like about it and why? Your input is invited. Post an article!